Taking the cable car, you see the side of sugar loaf mountain along which you climb the Via Ferrata. If you want to tell people you have seen Rio de Janeiro, there are a few “not to miss” attractions and one of them is the Pão de Açucar (Sugar Loaf). Most people go to the summit of Sugar Loaf the normal way: by cable trolley. There are however, alternative, more adventurous ways to get there…One of them is a walk to the top (referred to as “costão”), a three hour walk which involves a little rock climbing, but nothing too difficult. I doesn’t require prior climbing experience and can be done with normal running or hiking shoes. Another way of getting to the top is climbing via a steel cable that runs along the steepest side of the rock, called the “Via Ferrata”. This is a little more difficult than the walk, but it is so rewarding if you get to the top and see the sunset over Rio de Janeiro. The whole experience starts with a 20 minute uphill trail starting from the base of Sugarloaf, leading through the forest that covers most of the surrounding slopes, until you reach a ledge. From there it is a fairly steep climb to the place where the cable starts and for me, this was actually the hardest part, partially because I found out right there that I hadn’t brought my climbing shoes… I would have to go up with my Asics running shoes. Since Robson was leading the way, and he has been climbing since his teenage years, I was pretty confident that I was in good hands. Once the steep wall conquered, you just follow the steel cable upwards. The cable is rusted and you can cut your hands on little steel pins sticking out here and there, so wearing gloves is not a bad idea. Why take the easy way if you can make it more difficult huh? 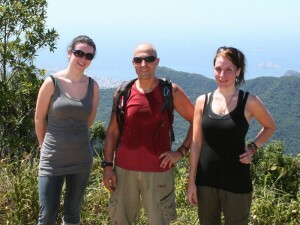 This was one of my first adventurous activities after moving to Brazil in January 2009. I have to thank Robson for taking me there. It was an awesome experience and I couldn’t have done it without him.